Who doesn’t like chocolate chip cookies! I was doubly thrilled when I found out that there is something like pumpkin chocolate chip cookies too, for two reasons. Reason one being, I got this big can of pumpkin puree (I think it’s the 15 ounce can) to bake my son’s birthday cake and I had a lot of leftovers. 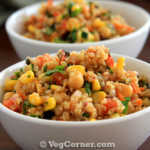 Took this as a great opportunity and made a couple of recipes using canned pumpkin puree! And all the five turned out great! The other reason I got excited about baking these chocolate chip pumpkin cookies was, of course, chocolate chips, cookies, what else!? Chocolate flavored cookies and cakes are my absolute favorites and my kids too. If you too are a chocoholic like us you may want to check out this list of different types of chocolate chip cookie recipes I have in the blog. 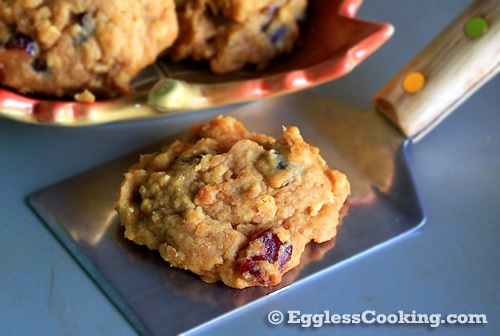 I baked these easy pumpkin chocolate chip cookies using this recipe as a base. I have made a couple of changes to make it egg free and also halved the original recipe to bake just 2 dozen instead of 4 dozen cookies. So you should be fine doubling this recipe if you want more cookies. Also next time I would like to try this as an oatmeal pumpkin chocolate chip cookies by increasing the quantity of oats in the recipe. Half flour and half oatmeal should work most probably. Tried out a couple of new recipes using canned pumpkin leftovers. 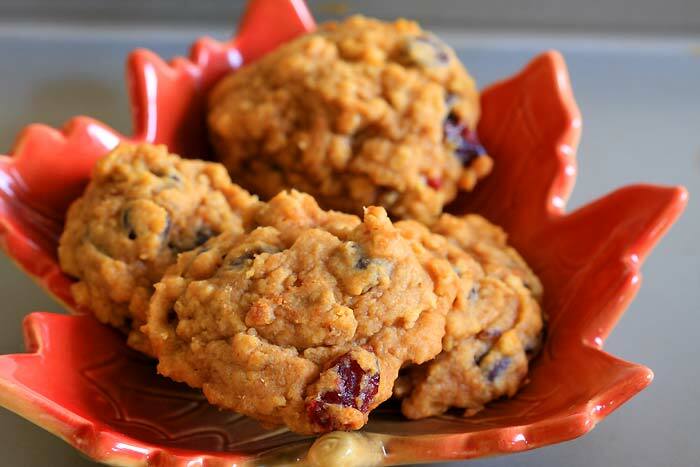 First it was the vegan pumpkin roll cake, vegan pumpkin cranberry bread, pumpkin cranberry scones and this pumpkin chocolate chip cookie recipe. I’m really not able to pick a favorite among these fabulous pumpkin recipes because each one was good at its own right. Thanksgiving is nearing and is there a better season to try more pumpkin recipes! I don’t think so. If you are not into baking and want to use that leftover pumpkin puree, another option is to simply make pumpkin chocolate chip pancakes. Add some chocolate chips to the vegan pumpkin pancake batter and that’s it. Use vegan chocolate chips if you want to keep it vegan throughout. I have seen a couple of recipes to make chocolate cake using chocolate cake mix and just pumpkin puree. I have to try it sometime and see how it turns out. 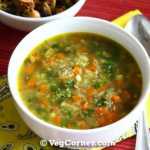 No oil, eggs or nothing need to be added in this recipe. Just two ingredients I believe. I wonder how pumpkin chocolate chip cookies using cake mix will turn out! 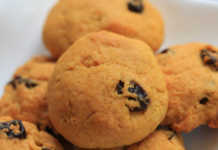 This recipe for pumpkin chocolate chip cookies is very easy to make, with simple ingredients. 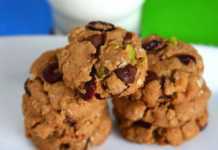 The cookies are soft, have a cake like texture and is enriched with pureed pumpkin, loaded with chocolate chips and cranberries and is a nice alternative to the usual chocolate chips cookies. 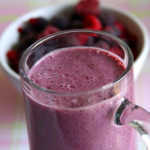 In a medium sized bowl mix together the dry ingredients except the chocolate chips and dried cranberries and set aside. Add the water, vanilla extract and canned pumpkin and blend it for another minute or two. Incorporate the dry mix into the wet mix and combine well. Refrigerate the dough for at least 20 minutes before baking. Meanwhile preheat oven at 350F/180C for 15 minutes. Line with parchment paper or grease baking sheet/s. Drop by tablespoonful onto the prepared baking sheet/s and bake it for 12-13 minutes in the middle rack. I took out mine after the 13th minute. Transfer the pan to a cooling rack and let it sit for another 5 minutes. After that move the cookies directly to the wire rack and let it cool completely before storing it in an air-tight container. It would be apt if I named these cookies as soft pumpkin chocolate chips cookies, because the texture was more like small pieces of cake. It was very soft and chewy. We loved both the taste and texture of the cookies. The sweetness was just perfect. I did a good thing by adding cranberries to balance the sweetness from the chocolate chips. Addition of the dried fruit gave a nice texture with every bite. You may add nuts of your choice too instead of the dried fruit and/or chocolate chips. Toasted and coarsely chopped walnuts and pecans would be the best. Nutritional Information: Calories for 1 cookie is 83. These pumpkin choc chip cookies can be the perfect snack even for babies, like a year old who are experimenting on new tastes and textures. In that case I would omit the chocolate chips, cranberries and oatmeal too. Or you could powder the oats instead so that there is no risk of choking. I made these cookies using store bought canned pumpkin. If you prefer using homemade pumpkin puree, see that the puree is solid and thick and not watery. Since I used a very large baking sheet I was able to fit all the 24 cookies in that sheet itself. 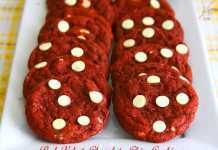 This recipe can be doubled to bake 4 dozen cookies. 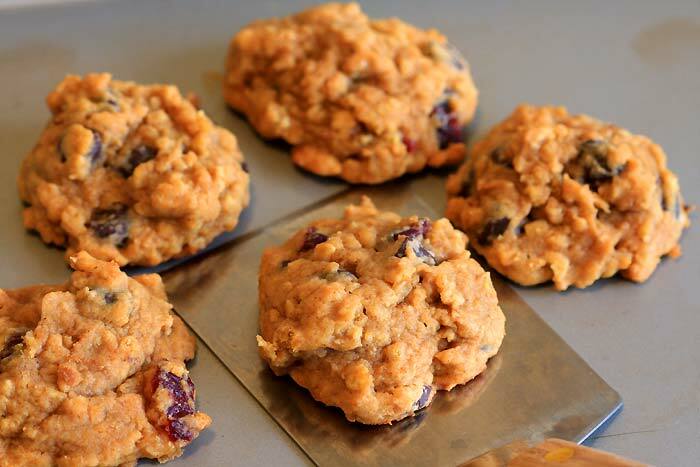 Check out this vegan pumpkin chocolate chip cookie recipe if you want to bake a vegan version. Previous RecipeThe Best Vegan Pancakes Ever! You can do 2 things Sneha. Either just prepare the dough, scoop it out and freeze it. Bake it whenever you need it but add another 1-2 minutes of baking time. Or bake the cookies and store it in the freezer and thaw it the night before you need it. These are delicious!!!!!! My son is allergic to corn so we subbed the cornstarch with 1 T wheat flour and 1T white flour without a problem. 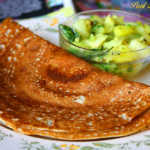 Thanks again Madhuram for another great eggless recipe!